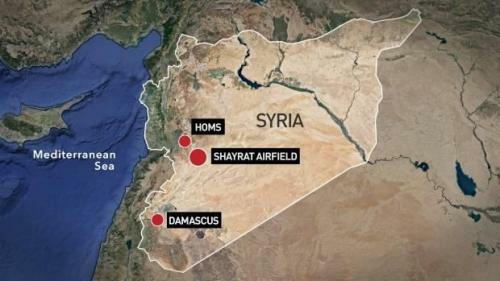 Update: The Syrian military announced at approximately 1:10 A.M. local time that the Israeli Air Force fired several missiles towards the Shayrat Airbase and its surrounding area in the Homs Governorate. According to the statement, the Syrian Air Defense managed to intercept several of the missiles, but there was no mention as to whether or not the Israelis scored any direct hits. This attack by Israel tonight marks the second time in seven days that they have targeted the eastern countryside of the Homs Governorate. We had barely finished commenting on Israel’s admission that it was responsible for last Monday’s deadly strike on Syria’s T4 military base – supposedly in retaliation for an Iranian drone flight in February – when reports hit of another Israeli strike, this time targeting Syria’s Shayrat airbase near Homs. According to other unconfirmed reports, Syrian air-defenses are said to have shot down unidentified objects over the capital Damascus, with locals reporting up to 7 missiles have been fired, although it was not clear what the targets were. According to Al-Masdar News, the Syrian Air Defense fired several missiles at suspected Israel warplanes that reportedly entered from eastern Lebanon. The the Syrian Air Defense reportedly continues to target these suspected warplanes. According to unverified twitter reports, the Syrian Air Defense is attempting to down these warplanes that are flying over the eastern slopes of the Qalamoun Mountains. According to subsequent unconfirmed reports, Israel is once again targeting the same T4 airbase it just confirmed it had attacked last Monday, as we discussed earlier. The attack takes place less than two days after another alleged Israeli attack targeted the Iranian Jabal Azzan military base in southern Aleppo which allegedly left 20 people dead.